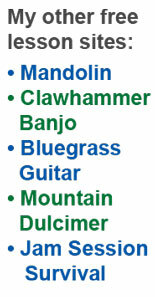 In this exercise you will combine the fretted note rolls with the thumb-pinch lick. Just hold down your left middle finger just behind the 2nd fret on the 3rd string. You need to curl your middle finger a bit so that you don't mute or bump the 2nd string. Use the tip of your finger to press the string down. Of course, you release the finger and allow it to rise slightly above the 3rd string when you get to that final thumb pinch. Those repeat signs mean... well, repeat. Perhaps fifty thousand times! Buy ear plugs for your family and just keep pickin' it--nice and steady. This slide is done by fretting a note with a left hand middle finger and then, after it is picked by the right hand, you slide the fretting finger up to another note. 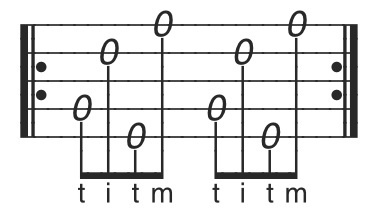 In this slide you will go from the second fret of the third string up to the third fret. Other than the slide, it is exactly like the exercise in Track 7. After you slide up to the third fret, lift your finger off of the string and move it back in place for the next slide. 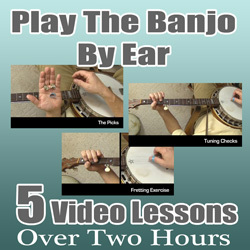 That video is a clip from my "Play The Banjo By Ear" video course. You'll see more info about those videos below if you think they could help you. This is the same old Thumb In and Out Roll--just do it starting on the 4th string.